People believe many things about Buddhism that simply are incorrect. They think Buddhists want to get enlightened so they can be blissed out all the time. If something bad happens to you, it's because of something you did in a past life. Everybody knows that Buddhists have to be vegetarians. Unfortunately, much of what "everybody knows" about Buddhism isn't true. 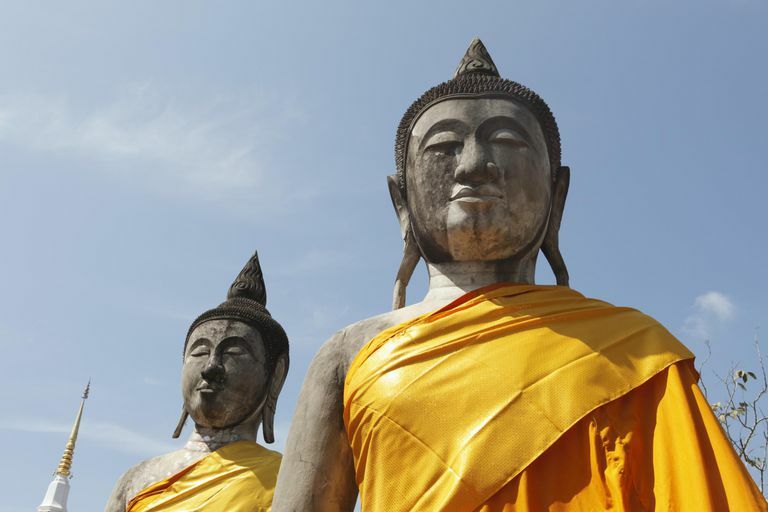 Explore these common but mistaken ideas many people in the West have about Buddhism. Many diatribes are written opposing the Buddhist teaching that nothing exists. If nothing exists, the writers ask, who is it that imagines something does exist? However, Buddhism does not teach that nothing exists. It challenges our understanding of how things exist. It teaches that beings and phenomena have no intrinsic existence. But Buddhism does not teach there is no existence at all. The "nothing exists" folklore mostly comes from a misunderstanding of the teaching of anatta and its Mahayana extension, shunyata. But these are not doctrines of non-existence. Rather, they teach that we understand existence in a limited, one-sided way. Everyone's heard the joke about what the Buddhist monk said to a hot dog vendor -- "Make me one with everything." Doesn't Buddhism teach we are one with everything? In the Maha-nidana Sutta, the Buddha taught that it was incorrect to say that the self is finite, but it is also incorrect to say that the self is infinite. In this sutra, the Buddha taught us not to hold on to views about whether the self is this or that. We fall into the idea that we individuals are component parts of One Thing, or that our individual self is false an only an infinite self-that-is-everything is true. Understanding the self requires going beyond concepts and ideas. If you define reincarnation as the transmigration of a soul into a new body after the old body dies, then no, the Buddha did not teach a doctrine of reincarnation. For one thing, he taught there was no soul to transmigrate. However, there is a Buddhist doctrine of rebirth. According to this doctrine, it is the energy or conditioning created by one life that is reborn into another, not a soul. "The person who dies here and is reborn elsewhere is neither the same person, nor another," Theravada scholar Walpola Rahula wrote. However, you don't have to "believe in" rebirth to be a Buddhist. Many Buddhists are agnostic on the matter of rebirth. Some schools of Buddhism do insist on vegetarianism, and I believe all schools encourage it. But in most schools of Buddhism vegetarianism is a personal choice, not a commandment. The earliest Buddhists scriptures suggest the historical Buddha himself was not a vegetarian. The first order of monks begged for their food, and the rule was that if a monk was given meat, he was required to eat it unless he knew that the animal was slaughtered specifically to feed monks. The word "karma" means "action," not "fate." In Buddhism, karma is an energy created by willful action, through thoughts, words, and deeds. We are all creating karma every minute, and the karma we create affects us every minute. It's common to think of "my karma" as something you did in your last life that seals your fate in this life, but this is not Buddhist understanding. Karma is an action, not a result. The future is not set in stone. You can change the course of your life right now by changing your volitional acts and self-destructive patterns. Karma is not a cosmic system of justice and retribution. There is no unseen judge pulling the strings of karma to punish wrongdoers. Karma is as impersonal as gravity. What goes up does come down; what you do is what happens to you. Karma is not the only force that causes things to happen in the world. If a terrible flood wipes out a community, don't assume karma somehow brought about a flood or that the people in the community deserved to be punished for something. Unfortunate events can happen to anybody, even the most righteous. That said, karma is a strong force that can result in a generally happy life or a generally miserable one. People imagine that "getting enlightened" is like flipping a happy switch, and that one goes from being ignorant and miserable to being blissful and serene in one big technicolor Ah HAH! moment. The Sanskrit word often translated as "enlightenment" actually means "awakening." Most people awaken gradually, often imperceptibly, over a long period of time. Or they awaken through a series of "opening" experiences, each one revealing just a little more, but not the whole picture. Even the most awakened teachers are not floating around in a cloud of bliss. They still live in the world, ride on buses, catch cold, and run out of coffee sometimes. This idea comes from a misreading of the First Noble Truth, often translated "Life is suffering." People read that and think, Buddhism teaches that life is always miserable. I don't agree. The problem is that the Buddha, who didn't speak English, didn't use the English word "suffering." In the earliest scriptures, we read that he said life is dukkha. Dukkha is a Pali word that contains many meanings. It can mean ordinary suffering, but it can also refer to anything that is temporary, incomplete, or conditioned by other things. So even joy and bliss are dukkha because they come and go. Some translators use "stressful" or "unsatisfactory" in place of "suffering" for dukkha. "Buddhism is not a religion. It's a philosophy." Or, sometimes, "It's a science of mind." Well, yes. It's a philosophy. It's a science of mind if you use the word "science" in a very broad sense. It's also religion. Of course, a lot depends on how you define "religion." People whose primary experience with religion tend to define "religion" in a way that requires belief in gods and supernatural beings. That is a limited view. Even though Buddhism does not require belief in God, most schools of Buddhism are highly mystical, which puts it outside the bounds of simple philosophy. "Buddha" also represents enlightenment itself and also Buddha-nature -- the essential nature of all beings. The iconic image of the Buddha and other enlightened beings are objects of devotion and reverence, but not as gods. When people hear that Buddhist practice "non-attachment" they sometimes assume it means Buddhists can't form relationships with people. But that's not what it means. At the basis of attachment is a self-other dichotomy -- a self to attach, and an other to attach to. We "attach" to things out of a sense of incompleteness and neediness. But Buddhism teaches the self-other dichotomy is an illusion, and that ultimately nothing is separate. When one intimately realizes this, there is no need for attachment. But that doesn't mean Buddhists cannot be in close and loving relationships.